Last year’s partisan redistricting, or gerrymandering, of Wisconsin’s legislative districts by Republicans dramatically altered the political geography of the state. 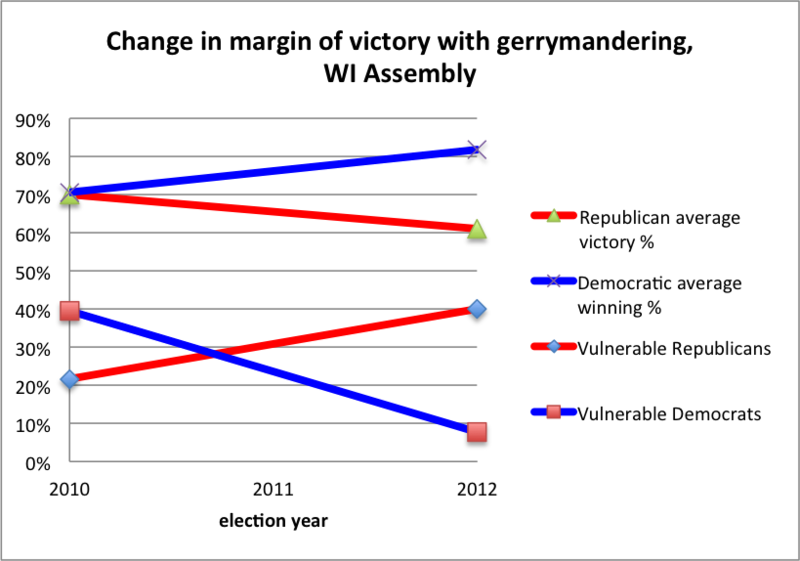 The immediate effect of gerrymandering was to allow Wisconsin Republicans to retain control of the legislature despite losing the popular vote in the November 6, 2012 elections. This basic point has been widely reported by the press, and illustrated with analyses of election results. These reports and analyses, while generally accurate in their description of how gerrymandering affected the November 6 election, fail to accurately explain the implications of gerrymandering for future elections; in particular how gerrymandering creates risks for Republicans that in the long-term may be as bad or worse than the short-term damage it has inflicted on Democrats. These risks can be seen by carefully comparing the results of the 2010 and 2012 Assembly elections. The Effect of Gerrymandering on the November 6th Election. On November 6, 2,668,874 votes were cast for Republicans and Democrats in Wisconsin Assembly elections. Republicans got 1,253,587 votes (47%), while 1,415,287 (53%) went to Democrats. Despite this, Republicans won 60 (61%) of 99 Assembly seats, while Democrats won 39 (39%). These widely reported numbers do not convey how profoundly the November 6 results were distorted by gerrymandering, taking Wisconsin very far from the one person, one vote ideal. This effect is best seen by looking at the election results from the bottom up, rather than the top down. How did redistricting affect the power of individual voters? The average Republican Assembly member won their seat with 20,893 votes, the average Democrat with 36,289 votes. It took 1.74 Democratic votes to have the same electoral effect as 1 Republican vote. In other words, each Republican citizen has 1.74 more times representation in the Assembly than each Democratic citizen. Even before redistricting, Republicans were overrepresented in the Assembly. In the 2010 elections the average Republican won with 17,742 votes, the average Democrat with 21,825 votes, which gave each Republican voter 1.23 times more representation than each Democratic voter. Several media reports have suggested that the Democratic edge in the popular vote for Assembly is artificial, because it includes votes cast for Democrats in uncontested races, where no Republican votes were recorded because there was no Republican candidate to vote for. Because 19 Democrats and only 4 Republicans won in uncontested races, the Republican vote total would have increased more than the Democratic total had both parties had candidates in all races. The notion that Democratic vote totals in uncontested races should not be included when comparing popular vote totals ignores the fact that creating uncontested Democratic districts was one of the primary goals of gerrymandering. Before redistricting, 13 Republicans and 8 Democrats won uncontested Assembly races. After redistricting those numbers were 4 and 19, respectively. These 19 uncontested districts are heavily Democratic by design. Any Republican who ran in one likely would receive few votes. Including results from uncontested races in popular vote totals does not over-represent the Democratic vote by nearly as much as some reporters have suggested. However, if Republican candidates had run in the uncontested races, Democrats still would have won the popular vote. Even under the unlikely assumption that hypothetical Republicans in these races received the same number of votes as Republicans received in the average race where a Democrat won, Democrats would have won the popular vote, albeit by a smaller margin (50.5%). Republican voters still would have been overrepresented in the Assembly by 1.58:1 compared to Democrats. 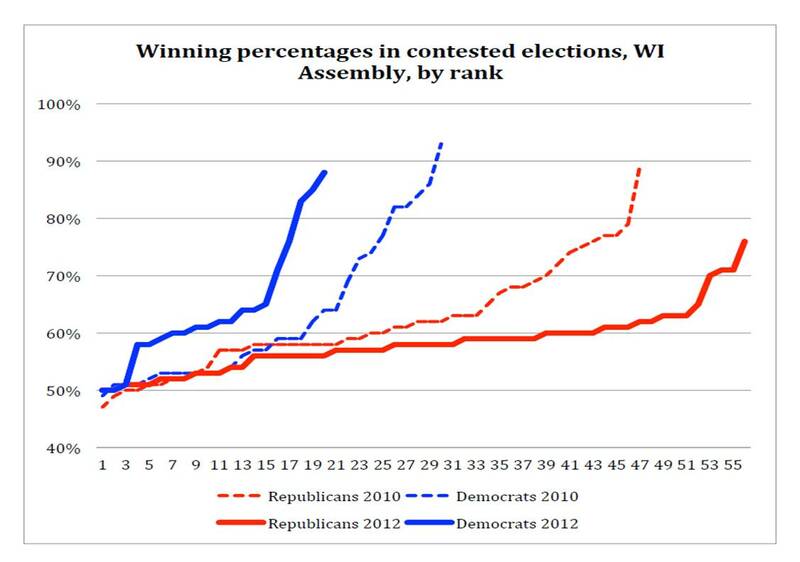 The Wisconsin Legislature was little changed by the 2012 election, but the status quo was maintained only because Republican gerrymandering radically altered the compositions of Wisconsin’s legislative districts. Had the 2010 legislative districts been in effect in the 2012 election, Republicans probably would have lost control of the Assembly. This much is common knowledge. But there is more to gerrymandering than meets the eye. This is a mistake. In fact, it is mathematically impossible. Gerrymandering can either make it more difficult for a party to lose elections, or give it a greater share of legislative seats. On a statewide level, it cannot do both at the same time. The 2011 redistricting did make some seats safer for Republicans, but the overall effect was to make Republican seats less safe (see figures). In fact, it is possible that Republicans have pushed gerrymandering too far for their own long-term good, making them vulnerable to greater electoral losses than they would have experienced with the old districts. At the very least, gerrymandering has created new vulnerabilities for Republicans while leaving Democrats relatively secure in their remaining seats. To see how gerrymandering can hurt Republicans, imagine a state divided into 100 districts where the electorate initially is evenly split between party A and party B within each district. Each party initially controls 50 seats, but by a coin toss Party A gets to redraw the districts in the way that give it the most political advantage. What should party A do? There are two basic and opposing strategies, a defensive one and an aggressive one. At the defensive extreme, party A could redraw the districts to give itself 98% of the vote in 51 districts, and party B 100% of the vote in 49 districts. This would lock Party A into a majority from which it could be dislodged only if its share of the vote in two or more of its districts dropped to below 50%, a big fall from 98%. Such a majority would be extremely stable but not very effective, because any measure it backed could be blocked by any single member of party A voting against it, and it would be easy for party B to peel off enough votes from party A to get its own measures passed. At the aggressive extreme, party A could give itself 50.5% of the vote in 99 districts. A 99:1 majority would be very effective in the short term. Party A could pass almost any measure it wanted, and party B could do nothing, as long as the majority held. However, a 99:1 majority would be extremely unstable. A 1% shift in the popular vote, if evenly distributed among all of the districts, would cause party A to lose all of its seats. An important point here is that by extending its majority as far as mathematically possible, party A is putting all of its seats at risk, not just the 49 additional seats it got through redistricting. With a large legislative majority held by small margins in each district, any substantial shift in the popular vote toward party B would be a catastrophe for party A, while shifts in the popular vote in its favor would give Party A no additional power. Under these circumstances, Party A could retain its power only by reducing the turnout of party B voters, and/or by moderating its positions enough to reliably attract a sizable number of party B voters in every election. The defensive and aggressive extremes are end members of a spectrum of gerrymandering strategies. One extreme creates stability at the expense of political power, the other extreme increases short-term political power at the expense of stability. Clearly, party A will maximize its political power if it gives itself a legislative majority large enough to allow it to effectively pursue its own policies, but not so large that it makes it excessively vulnerable to future changes in voting patterns. Gerrymandering is very much like playing the game Risk. In Risk, it often happens that a player who controls most of the map with a few armies in each country ultimately loses to a player who has spent the game amassing large armies in just a few countries. The situation in a real place like Wisconsin obviously is more complicated than in the abstract example, but the fundamental dynamics are the same. When Republican lawyers sat down to redraw Wisconsin districts last year, their task was to create Republican majorities in as many districts as possible without diluting the Republican vote to the point where they would lose control of the legislature if the popular vote were as heavily Democratic as it was in 2008. Republicans lawyers did a good job of protecting Republican legislators from the 2012 election, but will this advantage hold into the future? As shown in Figs 1 and 2, Republican Assembly members won their races by smaller margins in 2012 than in 2010, with a much larger fraction of them winning with 57% of the vote or less. At the same time, the number of vulnerable Democratic Assembly members dropped dramatically. Overall, Republicans went from being somewhat less vulnerable to catastrophic defeat than Democrats to being substantially more vulnerable. This is the expected and necessary consequence of retaining the same majority despite a 7% drop in share of the popular vote. The essential point is that disproportionate power comes at a price. Gerrymandering is a two-edged sword. A party cannot gerrymander itself into a larger share of the legislature than it has of the popular vote without increasing its risk of an electoral defeat that will leave it with a smaller share of the legislature than it has of the popular vote. Vote totals used here included some preliminary results, and may differ slightly from other vote totals being circulated. These differences are trivial and do not affect the analysis. Documents relating to gerrymandering released under court order show that Michael Best & Friedrich, the firm hired by Wisconsin Republicans to redraw districts, used the 2008 election as a benchmark of Democratic electoral success. Assembly members who won with 57% or less of the popular vote (“vulnerable” members). In short, the 2011 gerrymandering ultimately could hurt Republicans. Democrats need to pick up 11 seats to take control of the Assembly. In the last election, 11 Republicans won by 3% or less. If the Democratic share of the popular vote shifts to 56% from 53%, there is a good chance that Democrats will win enough seats to take control. That is a large but not unrealistic shift, and it would still leave the Republicans with a larger share of Assembly seats than the popular vote. However, if the popular vote shifted to 60% Democratic, Republicans likely would lose 25 seats, leaving them with 35% of Assembly seats while winning 40% of the popular vote. Under the 2010 districts, the same shift would cause the Republicans to lose only 15 seats, giving them 45% of the Assembly vote based on 40% of the popular vote. Thus the point at which the current gerrymandered districts will begin to work against Republicans will be reached when the Republican share of the popular vote drops to less than 40-44%. The odds for Democrats getting 60% of the popular vote from the current Wisconsin electorate are low, although they will increase as demographic changes continue to erode the Republican base. However, there is one more factor that needs to be considered: incumbency. Incumbents have an inherent advantage in elections, especially in local elections like Assembly races, where there is little advertising and many voters go to the polls without even knowing the names or party affiliations of challenges to the incumbent. Gerrymandering means that many Republican Assembly members come from districts where Democrats run strong challenges to Republican incumbents. As these incumbents retire, Republicans will have a much harder time retaining their seats than they would have had with the 2010 districts. Figure 2: Victory margins of Democratic and Republican Assembly members in the 2010 and 2012 elections. Note the large fraction of Republican seats that were won by relatively small margins in 2012. The power of incumbency may currently be shielding the Wisconsin GOP from the negative consequences of its own gerrymandering. As shown in Fig 2., if seats won by incumbents with less than 60% of the vote are vulnerable to Democratic takeover, Republicans are in danger of losing to attrition not just their majority, but the disproportionate legislative power that they sought to expand through gerrymandering. Even if Republicans can retain their Legislative majorities, it is not true that Republican legislators can advance divisive legislation without risk, as Rickert claims. Just the opposite. Republicans are more, not less, vulnerable to voter retaliation with the current districts than they were before. The current circumstances dictate a cautious, defensive strategy for the Republicans, along with the implementation of as many voter suppression measures as they can get away with in the courts. Democrats, on the other hand, are operating from a secure base, and could benefit greatly from aggressively attacking Republicans. In particular, targeting vulnerable Assembly and Senate incumbents at the local level, where advertising is cheap and political advertising beyond yard signs is almost non-existent, could be a very effective way of accelerating the collapse of an over-extended GOP. ‘Democrats, on the other hand, are operating from a secure base, and could benefit greatly from aggressively attacking Republicans.’ The operative word is ‘could’. I’m at least as unhappy with the alleged ‘dems’ as with the repubs, maybe even more, because they’ve betrayed me as a working/lower class person. When was the last time you saw a ‘dem’ aggressively attacking Republicans? Barrett? Barrett in the ‘recall’? Why didn’t the ‘dems’ point out, for instance, that Walker’s chief stooge had embezzled from vets, and their widows and orphans, and used the money to take his boyfriend to Hawai’i? Why didn’t they point out that Russell had been in the car with his partner when his partner tried to pick up a minor boy. We know why, but this was NOT the time to go all PC, it was time to go for the jugular. The real reason the ‘dems’ don’t want to win is that their masters at WMC don’t want them to win, They want the repubs to win. There IS a clear philosophical distinction between the ‘dems’ and the repubs: the repubs are attack dogs, the ‘dems’ are lap-dogs. But they’re all bowsers! Vote Green! Great analysis. Although a party’s gains by gaming the map may be transitory, many of us feel cheated that the majority party gets to choose its constituents–and would support a constitutional amendment to make the process mechanistic, rather than partisan. If that sort of rule is workable, it would tend to give compact, nonsalamanderlike districts. Of course, implementing it would take some very clever computer programming. Oops–the above isn’t enough for a unique solution. For example, if the state were a circle with uniform population density, to be chopped into four districts, it could be sliced north-south and east-west, or, any other orientation of perpendicular cuts through the center: still infinite choices. Several assembly districts each include part of the city of Madison, and part of the surrounding countryside. The “minimize boundary length” or similar mechanism to ensure compact, unsalamanderlike districts, would produce compact, all-city districts–heavily liberal–and other, noncity districts–more right-wing. This would enshrine in law an extreme form of the Republicans’ 2010 efforts to pack all the liberals together, to remove them from competitive districts. Would that be good or bad? In the all-city districts, no Republican would bother to run. But, maybe a Progressive Dane, Green, or other liberal non-Democrat candidate would run in those districts. Creating some very liberal districts could end up seating some legislators other than Democrats or Republicans. In the Wisconsin Citizens Media Coop https://wcmcoop.com/ article entitled “Republican gerrymandering creates opportunities for Wisconsin Democrats” the author Hematite makes a case for the Republicans being vulnerable to losing majority control of the State Senate and the Assembly. The Republicans swept the election for Governor by 5.77% (52.25% to 46.48%), U.S. Senate by 4.84% (51.86% to 47.02%), the State Senate improving to 19-14 majority from a 15-18 minority and the Assembly to a 59-39 majority from a 45-50 minority. In 2012, despite Obama beating Romney by 6.84% (52.78% to 45.94) and Tammy Baldwin beating Tommy Thompson by 5.55% (51.41% to 45.86%), the Republican increased their control in the Assembly (60-39) and took back control of the Senate 18-15 after having fallen to a 16-17 minority due to the recall elections. From 2010 to 2012 we had a landslide movement, the Republicans suffered the very large reversals of 12.61% for the chief executive (Gov compared to Pres.) and 10.39% in the U.S. Senate seats and yet strengthened their hold on the Legislature. Gerrymandering has worked very well for them and even if they can not create districts that are completely advantageous in every imaginable electoral situation, the cramming of x number of democratic leaning voters into a safe Democratic district frees up approximately x number of Republican leaning voters to strengthen two Republican districts with x/2 voters leaning their way. But all of this is a distraction from the fact that we have government of the political gangs, by the Democratic and the Republican officials, for the special interests. We need “a new birth freedom” to obtain Abraham Lincoln’s ideal of “government of the people, by the people, for the people”. Gerrymandering gives an advantage to the party that creates the districts. But it is the districts themselves that create the dividing and conquering that prevents the citizens that want independents and members of third parties to represent them in the legislature. People fought and died for the right to vote and there was a long struggle to obtain equal representation, the ideal of one person, one vote. Instead of giving us equal representation, the political insiders gave us districts of nearly equal population. Hematite shows us that this approach is far from ideal even if one just considers the minorities of the people who vote for Democrats or Republicans. We need to construct a system that allows everyone the representation of their choice. We can do that by eliminating districts and upgrading votes into powerful enduring proxies. Good points. Gerrymandering is the most obvious and drastic consequence of winner-take-all elections. I was going to bring that up in the article, but it was already too long. Gerrymandering is not just a dirty trick made possible by the current electoral system. It is a necessary part of the current system. Even the goal of a legislature that fairly represents the popular vote cannot be achieved with winner-take-all districts WITHOUT some kind of gerrymandering. Districts are anachronistic. They made a lot more sense when travel and communication were more difficult than they are today. if the goal is fair legislative representation, almost any system would be better. There are senses in which city dwellers have concerns unique to them; likewise farming areas; likewise rich gated communities. Creating districts that each contain only inner-city, or only rural, or only wealthy suburb, allows for representatives that come to the legislature to argue, respectively, for state-subsidized public education, social services, public transportation; or, farm subsidies, state-subsidized county roads, lax environmental laws; or, low taxes, low taxes, low taxes. Creating districts that each have the same mix of all these areas brings legislators that each have to answer to multiple competing constituent concerns. Or, do we put several hundred candidates on the ballot, and seat the 99 highest vote-getters in the assembly? Griff Palmer and Michael Cooper in the New York Times point out that partisan gerrymandering has tilted Congress and legislatures toward Republicans all over the country: 40 percent of maps were drawn by Republicans, 10 percent by Democrats. In either case, the dominant party won just over 50% of the popular vote, yet captured over 70% of the seats by gerrymandering. In those states, each party’s share of the seats closely matches its share of the popular vote. Actually, Democrats got 60% of the WI Assembly vote in 2008, and Rs got 45 seats, just as your model projected. And now the stakes are raised again, as Republicans get ready to change Wisconsin’s electoral college allotment to award one electoral vote to each congressional district—making a blue state send a red president to the white house. I have to side with Chris Rickert on the gerrymandering math Hematite. By your own example, you can create a half way game- Party A holding a 2-1 majority in 75 districts and Party B holding 100% majority in the last 25. A 2-1 majority is perfectly safe for one party over a 10 year period when they can refine their maps again. At worst they may loose a few seats, but it would be nearly impossible for them to loose 26 in 10 years. Of course that is only under ideal circumstances. In the real world, those 11 districts with a 3% margin of victory will very likely make a big difference in future elections. Btw, thanks for the article! It has a lot of good data and analysis. I’m doing a study on how dramatically recent elections would have change if gerrymandering districts had been drawn differently. My hope is that when people see how much their elections are controlled by this process they will help push to abolish it. You can be this article will see a reference when I’m done! Scott Walker remembers creating jobs as assemblyman in Wisconsin . It was easy with ALEC. 32000 UNION public sector jobs. It is not as easy this time with out using your tax dollars. Scott Walker has created ALL Wisconsin`s budget problems working for ALEC. In 1997 Walker and Prosser as state assemblymen championed for ALEC with truth in sentencing telling the legislatures it would not cost a dime it was to give judges not parole boards the control over sentencing. Then Walker filibustered to stop sentencing changes after the fact misleading ALL the legislatures. With out the sentencing changes Wisconsin`s prisons quadrupled over night. Most people sentenced to 2 years now had to serve as much as 6o years. As the Wisconsin Budget watch Blog shows . Stopping just a percentage of these long sentences Wisconsin would save 707 million per year. Wisconsin could have free tuition colleges. It shows Wisconsin has wasted 100 billion if you add the numbers to the state budget since 1997. Not including the building new or remodeling of 71 courthouses & 71 county jails & 441 police stations and dozens of prisons 28 billion plus interest. The total is over 28 BILLION plus the 60 Billion spent by social services to support prisoners families because the bread winner was a political prisoner as US Att gen Eric Holder explained. Then farming out prisoners in several states until the courts realized it was not allowed in the Wisconsin constitution. Wisconsin then hired 32000 union public sector workers to fill the jobs housing the prisoners from deputies , judges, district attorneys all owe Walker for creating there jobs. 32000 UNION PUBLIC SECTOR JOBS. This cost taxpayers over 3.8 billion or a half million per day to house these EXTRA prisoners per day in Milwaukee county alone. Wisconsin claims it has 24,000 prisoners compared to Minnesota`s 5500. Wisconsin`s corrections population is 104,000 with many in half way house and county jails and county prisons that are not counted. . In 1995 Milwakee county had less than 200 prisoners now it has thousands. Is Scott Walker moving Wisconsin forward ? This your reason for budget problems in Wisconsin. Big spender big government Scott Walker. Why does he not work for the people he is taking his check from the people ? Walker is a ALEC man. ALEC has no place in any democracy. Wisconsin Budget watch blog has a great article on this subject. How did this prediction compare to November 2014 assembly, state senate district outcomes? If I read this article more intently, I might find i am wrong, but it seems that the better way to phrase the teathug predicament is that gerrymandering was Very Very Good to teathugs in the 2012 election, but will be successively less Very Very Good to them in later elections. I’d state the that the initial 2010-based gerrymandering will lose accuracy. The exactingly precise 2010-based gerrymandering (win by one vote!) maximized 2012 wins (cheats) for teathugs. The ‘mechanics’ I see as causing this is that district composition changes will gradually break precision hair-of-chinny-chin-chin gerrymandering. * Imagine each voter continues to vote reliably for the same party that the voter chose in 2012. * Imagine that dem voters in gerrymandered ‘ghettos’ moved to teathug-favoring gerrymanderd districts and vice versa. (In reality such population shifts won’t happen.) The resuts are the absolutely maximized worst for teathugs — dems win chinny-chin-chin gerrymandered districts by one vote. teathugs win only the gerrymander ghettoized districts. Nobody can precisely foretell population changes. So fro perspective of 2010 guessing, 2014 wins (cheats) were also as good as teathugs could obtain. 2016 results will be as good as could be guessed from 2010. Also obviously, there have been changes in other factors.